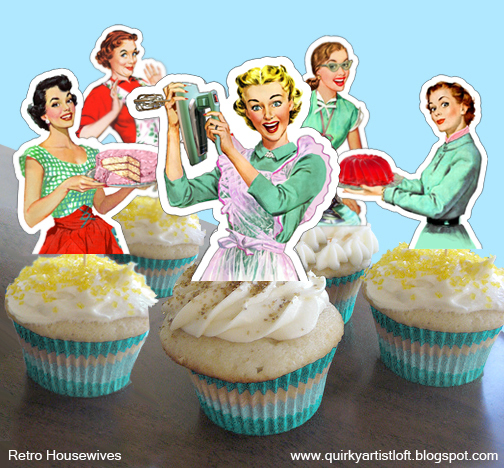 Are you throwing a retro theme bridal shower? Is it your wickedly awsome mom or grandma's birthday? Maybe it's Mother's Day and you want to surprise mom with some cupcakes! These are also perfect for celebrating cool gal pals! These ladies are collaged from various retro ads of the 1940s and 1950s. I pasted different heads on different bodies, changed the items in their hands and complelty changed the colours into a collection of atomic awsomeness! Modified by Alina (me) and for sale via Quirky Artist Loft as a printable file.